The RespiPro is a mask designed specially for People At Work. RespiPro has anti-splash layer to protect you against liquids. RespiPro meets the international protection standard EN-149 as FFP1 respirator. Half mask with carbon inside is perfect for everybody who needs protection from allergens, dust, smog, viruses and bacteria but needs to be protected from odours too. The special design and production material of this professional mask makes it a perfect choice for Doctors, Firemen, Policemen, Laboratory staff, Rescue men, Medical staff and Soldiers working in tough conditions. The strong nanofiber layer structure makes this half mask a perfect choice for these professionals to prevent themselves against allergens and bacteria without indulging in any kind of chemical substance. RespiPro Mask has certain qualities of protecting the health of users and gives an optimum protection against any kind of harmful particles in the air. The unique and innovative design structure of RespiPro mask includes multiple layers of nano-fiber membrane that filters out any kind of harmful particles and provides you with fresh and clean air to breathe in. Meets the international protection standard EN-149 as FFP1 respirator. RespiPro works mechanically using no irritating chemicals. Mask captures 99,9% dust, ash, allergens, bacteria and viruses. The mask has its unique shape and adhesive strips which make it fit perfectly and anti-splash layer protects from any liquid. The best mask for professionals – doctors, firemen, policemen, laboratory staff, rescue men, any medical staff. In each professional face mask is RESPILON® membrane. This membrane is an extremely dense network of strong nanofibers. The combination of these features of RESPILON® can stop even the smallest solid and liquid particles. What does this mean in practice? Dust, mould, but also smog, pollen, viruses, bacteria and mites - none of these can penetrate through the pores in the membrane. Does RespiPro meets any international standard of protection? Yes, professional half mask with RESPILON® nanofiber membrane meets the international protection standard EN-149 as FFP1 respirator. 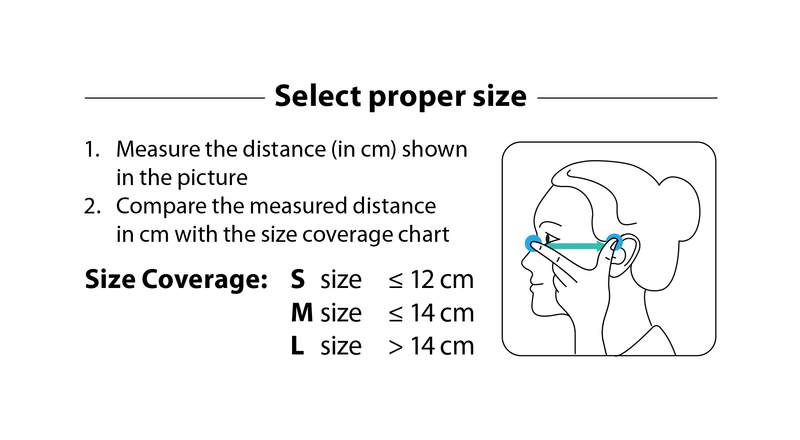 Please check the sizing chart – sizes are variable in each protection mask. If you want to use RespiPro against pollen, dust, smog, etc., it is possible to use ReSpimask repeatedly. If you use professional mask as protection from viruses or bacteria for example during flu epidemic, we recommend to use a new mask after each removing from your face (you never know who touches the mask on the table or if the the table is not contaminated). This product is not recommended for ages below 2,5 years. Please use under parental control.